The Great War had raged in Europe since 1914. President Woodrow Wilson, following the will of the majority of Americans, had valiantly sought to keep the United States neutral. 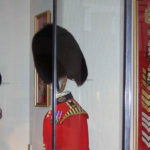 But, Great Britain was a staunch ally of this country and there was a desire to help but not to become embroiled in the bitter battles themselves. However, the German blockade and unrestricted submarine warfare (declared by the Germans in February of 1915) continued to erode America’s fragile neutrality. During that year, the Germans sank a U.S. flagged ship. Without warning, they torpedoed the liner Lusitania, killing 1,198 including 128 Americans. The Kaiser ordered a cessation of unrestricted submarine warfare, but in January of 1917, it resumed. The U.S. broke diplomatic relations with Germany. Following the sinking of another American ship, on April 2, 1917, and the appearance of the Zimmerman telegram (in which the German government purportedly tried to get Mexico on its side with the promise of regaining territory lost to the U.S.), Wilson reluctantly asked for a declaration of war. Congress did so on April 6. And so, America stepped into the conflict, in Wilson’s words, “to make the world safe for democracy”. The American Army numbered about 100,000 (with another 112,000 National Guardsmen) and was not ready for combat. When the first 14,000 troops arrived in Europe, they were initially placed under Allied command. But, the involvement of this country bolstered the Allied cause and the bloody stalemate of nearly four years began to turn against the Germans. American troops, under the leadership of General John J. “Black Jack” Pershing soon proved themselves on the battlefield, well supported by their country’s massive manufacturing might. Finally, on November 11, 1918, an armistice was declared and the war was over. By then, more than two million American soldiers had served in Western Europe. Fifty thousand of them would never return home. Rhode Island had begun to feel the effect of the conflict in Europe even before America entered the war. In March of 1917, military guards manned all the state’s principal bridges. Four divisions of Naval Reserves had left for training in Boston. Activities at the state’s coast defense forts and at the Navy base at Newport, RI, intensified and a small naval patrol station on Block Island. A full year prior, in 1916, Providence was the scene of a massive Preparedness Day parade with more than 54,000 people marching through the capitol city. Even cut short by rain, the parade outdid one held earlier in Boston that drew only 38,000. The Ocean State was ever patriotic. War fever even infected the local news media. In 1915, the then editor of the Providence Journal, John R. Rathom, began to publish outrageous stories suggesting German sabotage (the source of his information later turned out to be a British propaganda effort). Rathom went so far as to say that his newspaper’s own sources were unearthing sabotage plans. Eventually, the U.S. Justice Department cracked down and called a halt to Rathom’s fanciful reports. The state’s factories also geared up for war, as they would again just two decades later. Rhode Island began turning out everything from uniforms to horseshoes, small warships, aircraft, rubber products, and bayonets. By June of 1917, just two months after war was declared, more than 53,000 patriotic Rhode Islanders had enlisted in the military with more to come. War bond sales skyrocketed. Volunteers enrolled in the Red Cross and the state militia for homeland duty. Victory gardens appeared everywhere and supplemented an anticipated national food shortage. Gertrude Bray of Providence had gone overseas as a YMCA volunteer to support the troops. She left her factory job in Pawtucket, RI, to serve as a canteen worker in France. 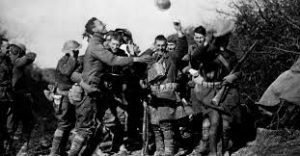 According to one news story, Bray and two other YMCA workers were cited for bravery during the Battle of St. Mihiel in September of 1918, when they cooked 10,000 donuts a day while the fighting went on close to their encampment. Women were chaperoned when they went to the front lines, which Bray did, to deliver food to the troops. At one point her chaperone, a Mr. Haley, told a reporter, “nothing raised the morale of the men to see that one of their own girls wasn’t afraid to come to their position”. Haley then hustled the donut girls back to their camp since an artillery barrage was expected momentarily. Among the young men who enthusiastically responded to the call to service was a Brown University student, Wheaton Vaughn. While overseas, he corresponded with one of his professors, H.E. Walters, and the letters have been preserved in the Brown University Library. 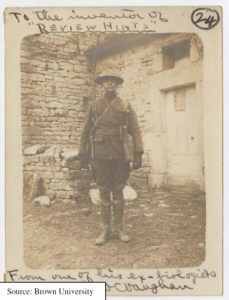 In one dated February 15, 1918, he enclosed a picture and told his teacher that he expected to be at the front shortly. “I’ll do my best to send some part of the Kaiser back to you for use in the (biology) lab”, he quipped. On June 16, he apologized for a delay in writing as “I have been so busy tending to such business as dodging shells and putting on gas masks…We have been lucky so far that’s all, I guess, but probably someday we will get ours, but here’s hoping.” Vaughn went on to tell his professor that so far only one man in his unit had been killed and another slightly wounded. Sadly, Vaughn’s own luck ran out in the last moments of the war. He died of wounds on November 18, 1918, two hours after the armistice was signed. The Armistice had actually been announced at 5:00 am Paris time, but military commanders on both sides, at a loss as to exactly when to cease firing, continued to fight until the “eleventh hour”. More men on both sides died needlessly in those six hours. And so, the war officially ended at 11:00am, Paris time, on the eleventh day of the eleventh month. It was 3:00am in Providence and church bells rang and whistles began to blow. Students from the schools on the East Side gathered and marched down College Hill to join the cheering crowds in Exchange Place (now Kennedy Plaza). Bunting bedecked automobiles sped through downtown. Brown’s military and naval units, joined civilians in celebrating. Brown Professor Walters, in notes preserved in the University Library recalled, “Westminster was no longer a one-way street. It was an every which way….I remember finding myself downtown with a cowbell in the midst of the downtown mob…all insane”. The celebrations continued. The war was over! Armistice Day, of course, is now known as Veterans Day (and in England, as Remembrance Day). It is a time to pause and remember those who responded to the call, not just in World War I, but also in all wars. Joining the rest of the nation, the Rhode Island World War One Centennial Commission, ably led by North Kingstown’s Matthew McCoy, has coordinated a yearlong observance around the state. On November 11, Rhode Islanders will join in a nationwide observance “Bells of Peace”. At exactly 11:00 am, bells will toll in churches and other sites. They will ring 21 times at five-second internals as a traditional symbol honoring those fallen in the war. No bell? You can download a smartphone app to be used privately or with a public address system. Visit www.ww1cc.org/bells for details. East Greenwich, RI, will join towns across the state and country in holding parades and laying wreaths at their respective World War I memorials. The East Greenwich event will be held Sunday, November 11, at 1:00pm (in event of rain a memorial will be observed in the Swift Gym). 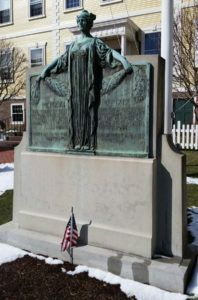 World War I Memorial in front of Town Hall in East Greenwich, RI. Eight and a half million died fighting the war. As many as 12 or 13 million civilians perished. In his classic 1929 novel recounting the horrors of World War One, Erich Maria Remarque cites the impact of the war from the German perspective, “The war has ruined us for everything.” Sadly, the “war to end all wars” was not. Almost as soon as the guns fell silent in Europe, the seeds of a new conflict were sown. Just twenty-one years later, in September of 1939, war broke out again. The Varnum Memorial Armory Museum contains a growing collection of artifacts from the Great War. Take an opportunity to view them and to recall those who served and those impacted by the conflict. Our mission as Varnum Continentals is keep the flame of patriotism brightly lit and to ensure that future generations remember the sacrifices of those who have passed before us to preserve and protect our treasured freedoms.